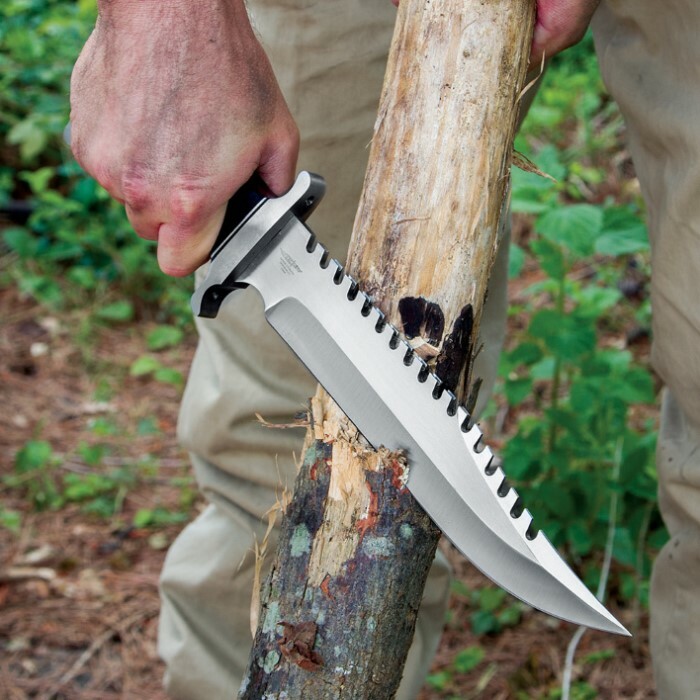 Gil Hibben's Extreme Survival Bowie was designed to survive the wilderness alright! Going back to his older designs of Bowie knives, he designed this one to continue his legacy. It has a razor-sharp blade with sawback teeth and lashing holes are predrilled into the guard and pommel for attaching a spear. It is 15 in. overall and comes with a certificate of authenticity. 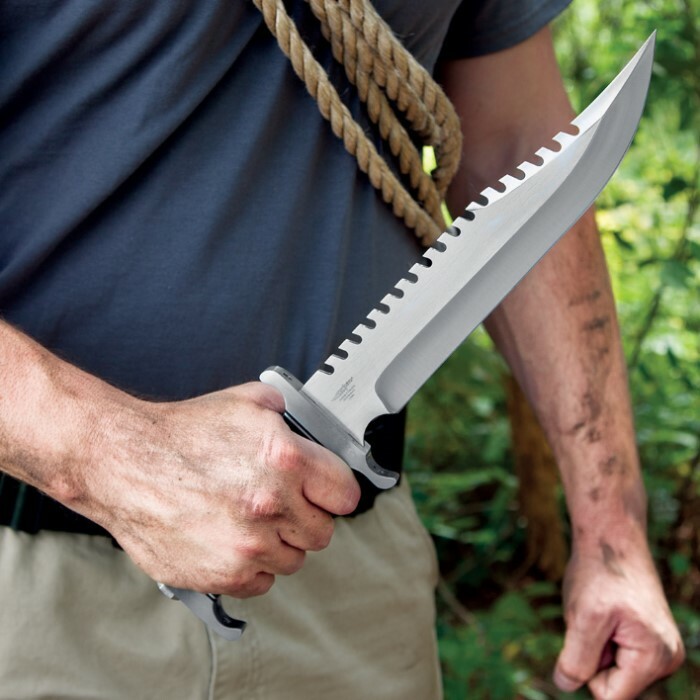 This is very close to Hibben's prototype for the Rambo 5 Knife, but that never came to be. it's done so well. just holding this in your head you can feel the quality it's a work of art. From Steve W on 7-10-16 Got my knife today, I must admit that this blade is awesome. It was fairly sharp out of the box. But the weight and balance of this blade is what sold me on it. another dynamite piece from BUDK at a reasonable price as well.keep it up, and fokes buy one, it will not disappoint you in any way. This is a beautiful knife. Very well made and finished and constructed of the highest quality materials. The sheath is also first rate. Caught it on sale 30% off. Great buy. I am having a lot of fun with it. Makes a great boar spear when lashed to a shaft. Gil Hibben knives are the highest quality. You should try one. If you like big knives this is a must have. doesn't come cheap so I waited for penny shipping. Have not tested it out. But the feels great in the hands. Not to light and good balance. 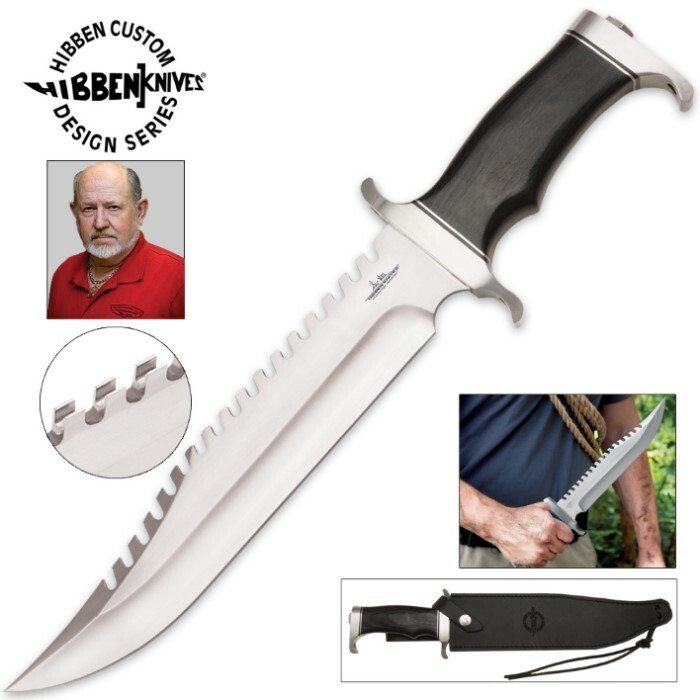 Plus Gil Hibben name backing it. enough said. This is a very good knife, when I arrived the first thing that surprised me was his strength, sharp and large. I am a boy scout and always use it when I go camping, never failed me and is totally a knife worthy of Gil Hibben. This knife is perfect because it is solid, sharp and made to last. When I arrived I was sorprendido by the size and sharpness. boy scout and I use it a lot in my adventures and so far has not failed me and is like new. A knife worthy of Gil Hibben. I'm a Hibben knife fan/collector. This knife is called "The Survivor" knife. First the Good: it arrived razor sharp, it's well balanced, the mirror finish is really pretty, most of the spine is thick enough to take a beating, and its heavy enough overall to do some chopping and a few basic survival functions. It would be a great wall hanger in someones man-cave or a great conversation piece of weaponry. The Not Quite As Good: The fit of the pieces of the knife is not really on par with other knives at this price point. The blade should fit into the handguard without any visible space between the guard and wide part at the base of the blade before it tapers down to the tang going inside the handle. Also, the spacers in the handle are not flush with the pieces they are separating which leaves an edge you can feel on each spacer. Not enough to cut your hand, but at this price point that fit should have been addressed. The only feature that really negates this blades use as a serious survival knife is that the last inch and a half of blade is really too thin for any serious "survivor" work. It was so thin at the tip when I got it that the very tip point of the blade was bent about 15 degrees to the left. For anything other than stabbing soft tissue, the tip may break off. Maybe it was meant to carve pits into olives for pimentos at the survival camp or something of that nature. However, the first time you stab it into any hard material you will likely draw back a broken or damaged blade tip because it's just too thin at the point. In summary, its a wicked looking knife and I decided to keep it because it's a Hibben and I got it on sale. But if someone is looking for a serious "real" survival knife, BudK has many other knives that would probably suit that purpose better...even if they don't look quite as good as this knife.